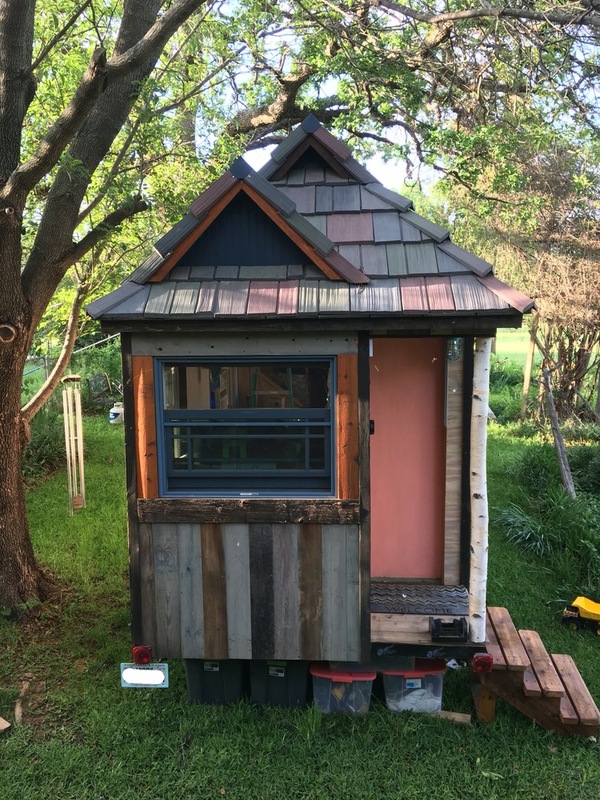 What is it that captures our attention and love of tiny houses? The idea from school days that all we value can fit in a backpack and travel with us? At DaVinci Roofscapes, we've been involved in several tiny houses over the years related to the television show Tiny House Nation (see Tiny Houses … Big DaVinci Roofs). Our polymer roofing tiles were selected for several of these small homes because of their aesthetic appeal, lightweight yet durable nature, and their ease of installation. We've also recently learned that one Texas family constructed a tiny house on wheels and have been blogging about their on-the-road lifestyle (see Tiny House 43). Their goal is to travel through all 48 of the Lower States before 2017 when they'll settle in Washington state. Turns out these industrious folks also used a Bellaforté Shake roof on their tiny home! As part of their blog, they report that they love their custom blend of Light Purple, Light Green, Light Violet and Dark Grey synthetic shake shingles that now top their tiny home. Homeowner Meg reports that, "It's the only thing on the entire house that never changed during the build. We found it several years ago when we were planning for a site built house in Washington, and we were stoked that we could use it on our tiny house. "The Bellaforté line in particular has a Miami-Dade level hurricane rating, which is perfect for making sure the roof stays put while we travel. And no, we weren't sponsored by them — we just reeeeally love our roof!" We're reeeally glad the family selected our composite shake roof for their on-the-road home! You can tour this tiny house (it only takes a few seconds!) by seeing the pictures HERE.